A few pics from the cruising and some comments. My first overnight was to Pulpit Harbour. It was a great harbour, and I grabbed a mooring for the night. A neighbour came over on his dinghy to say hi. He was on a very pretty PSC34 named Cookie. 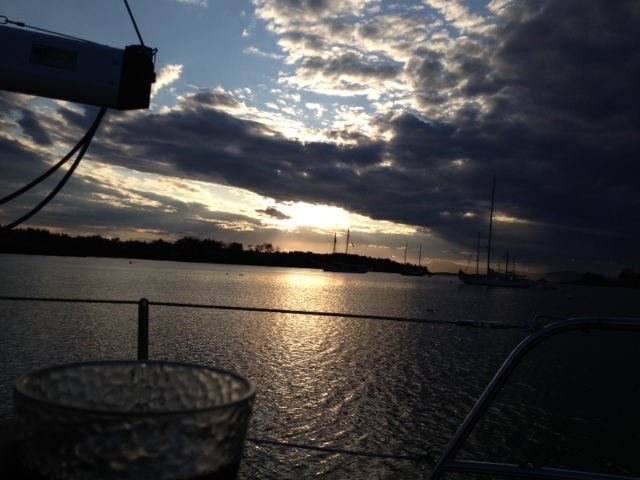 It was a nice night, and the following week I stayed there again after having some autopilot problems halfway through a planned cruise to another island. We spent the first night on the boat at the marina, and had a nice lobster dinner in town. The next day we sailed to Catine and went for a walk in the town. We put the boat at the city dock and walked into town, about a block in we found the Tap Room. Mmmm beer! The town was nice and had a lot of historical landmarks with some pretty funny signs. The signs would explain what happened when, then have some odd info at the end like "This person was burned here, after being compelled to eat his nose"
From Castine we anchored out in Holbrook Cove, just next to Castine. The new windlass worked great. The first anchor set was on rock, but the second was good mud. 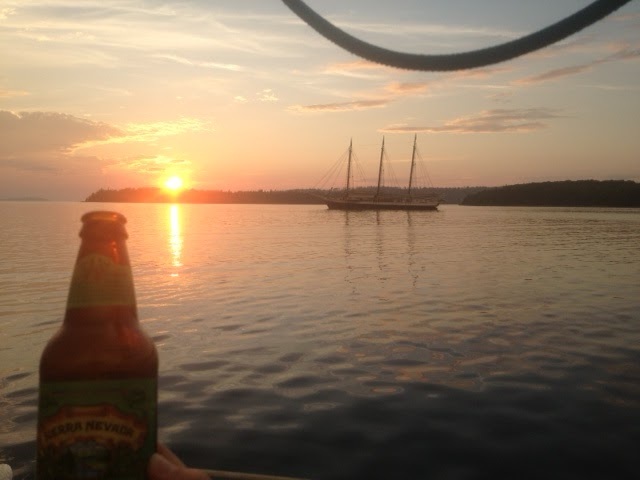 A tall ship anchored next to us, and was a pretty sight. 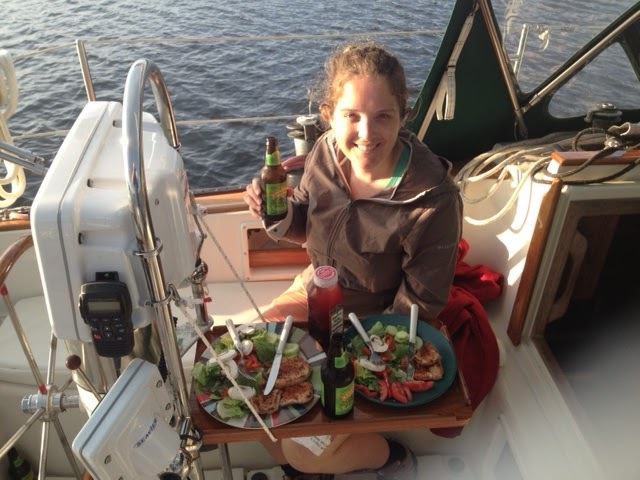 A very nice meal on the boat, Good Galley Wench! From Castine and Holbrook we sailed around the Penobscot river entrance, over to Belfast to check out the harbour there. We sailed into Belfast and sailed out. I made Eliza do about 4 tacks with about 3-4 minutes between them. It was good fun. We anchored that night (the 4th of July) in Searsport. This is a very open anchorage, and there was some wind, but the bottom was very muddy and good holding. We watched the fireworks, had another nice dinner, and did our best to kill a bottle of Bundaberg Rum. The next day we slept in, and were a little slow getting up. But we did go for a mid-morning swim before pulling the anchor. It was refreshing, and we used the cockpit shower with the hot water to wash off. It worked good, and was the first time I had used it. 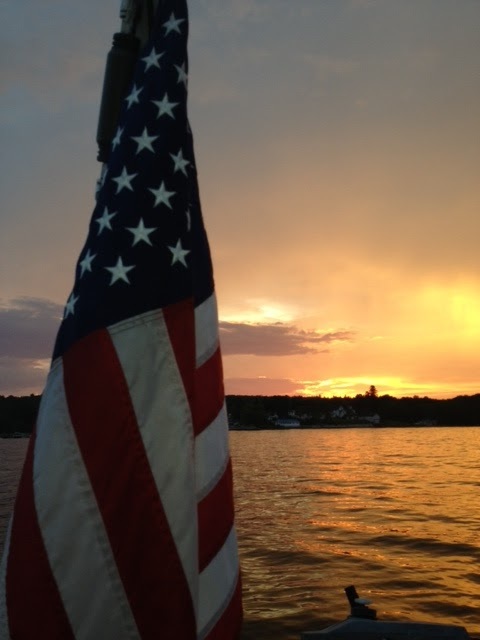 Old Glory on the 4th of July off the back of the boat. So middle of the night, the second anchor starts dragging. A nice pendulum swing and we are headed towards shore. I was watching it and caught it well in time, but what happened next was almost comical if it wasn't 1AM. I started the motor and pulled up the tail anchor. As soon as I put the boat in gear, I heard a sickening swish and then thump thump thump of the dinghy painter getting pulled into the prop. (I usually keep a very short leash to avoid this, but had forgotten my trip to set the anchor earlier in the dinghy...) So, there we are, drifting to shore with a rope around the prop. About this time Eliza woke up, I had her grab the rope knife (Hook knife on a stick) and I jumped into the dinghy and cut the line. We motored the boat and set the hook and everything worked out, but the next morning I had to go for a very cold swim (we were now on the edge of the Atlantic and far away from the river) to cut the rope. It worked out and we headed home, after a great 4 day trip.